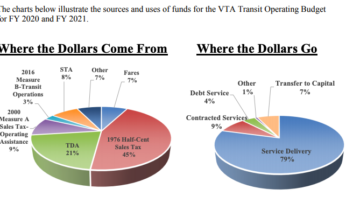 This evening, the Palo Alto Transportation Management Association is presenting its annual report to City Council.Â The dataÂ show that PATMA is shifting over 300 commuters away from driving solo, at half the annualized cost of a space in a parking garage, and comparable to the cost of other TDM programs. The majority of the budget is coming from a recent increase in the cost of full-price employee parking permits. Using information from an annualÂ survey of downtown workers, PATMA learned that low-income service workers drive at a much higher rate than higher-income tech workers. 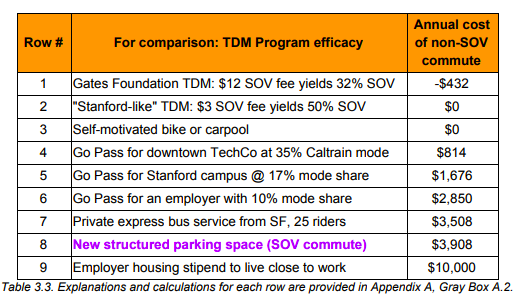 So programs are tailored for the needs of low-income service workers, including transit pass discounts, and an after-hours Lyft subsidy for low-income commuters living in nearby cities who commute before 6 AM and after 8 PM, times when transit options are limited.Â The most popular transit pass is Caltrain, disproving earlier stereotypes that low-income workers wouldn’t want to or be able to take the train. 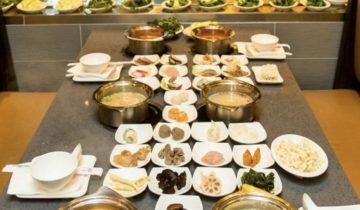 For the coming year, PATMA is considering program improvements including expansion to Cal Ave, bike pilot ideas, and shuttle services. 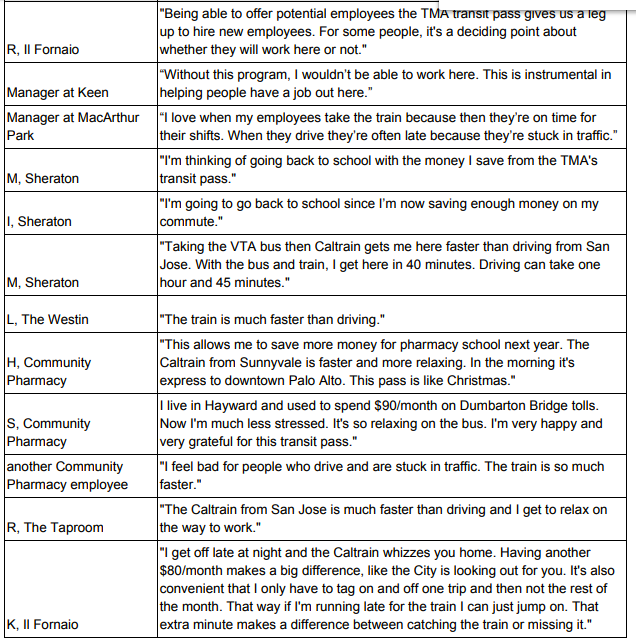 The program focusing on downtown workers – rather than large office park employees – is innovative in the region, and has benefits for traffic and parking reduction, and social equity by improving the commutes of low-income workers, with many happy customers (see the testimonials below).Â Other downtowns have similar issues, and likely similar opportunities.